Some happy mail arrived today! A few basics I've been resisting that I couldn't hold out on any longer. Such a colorful stack! Can you tell I've been craving color lately? I was thinking we might be getting an early spring, until we got 18 inches of snow yesterday, with more on the way this weekend. Such is life in the U.P. I guess. But back to the fabric. These are Riley Blake's So Sophie Dots in Purple and Blue. I bought all six colors of Running Stitch from Patty Young's Lush collection for Michael Miller. It's such a great basic! Four of Laurie Wisbrun's Modern Whimsy Circle prints by Robert Kaufman. I often get asked how much yardage I buy when I purchase fabric, so I'm going to start talking about it in my stash posts. I bought a yard of each of these. They're all simple basics that I know I'll use a ton! Especially the Lush and Modern Whimsy prints since they are one color + white prints that will go with everything. 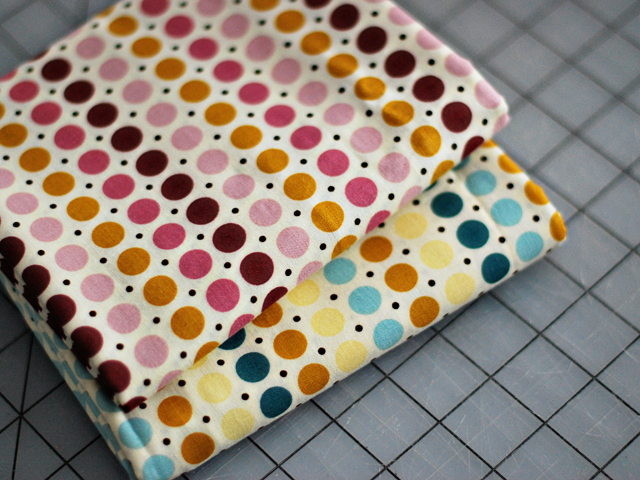 And the So Sophie dots are perfect for quilt backs, so I was tempted to buy more! I bought all of these from fabric.com since I had a coupon code (now expired) but I tried to link to fabric stores that have most of the prints still in stock. A lot of them seem to be sold out most places right now, but I'm sure they'll restock soon! I have a new project in the works this week and this new fabric is making me want to start sewing! I'm hoping to spend most of the weekend in my sewing room! Just need to get through work tomorrow first. I especially like the 'Running stitch'! I love all of these! I'll have to get my hands on some of them. I just ordered some circles yesterday. Great fabric stash! WOW! 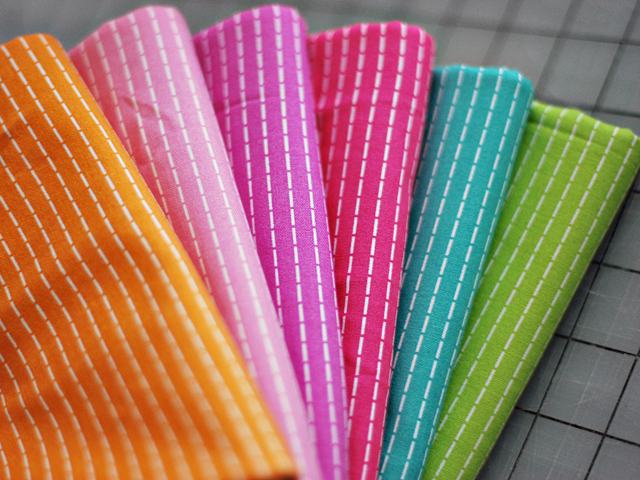 I forgot that I have that running stitch print in all colors in my Fat Quarter Shop cart, I might just have to click "buy" tonight -- they look so lovely here!! Great minds! I just did the same thing, making my bank account look sad but my sewing stash looks very happy!! I love that running stitch fabric. I may need all 6 colors too! OHHHHHHH I love all of these. Some serious basic shopping to be done I think. 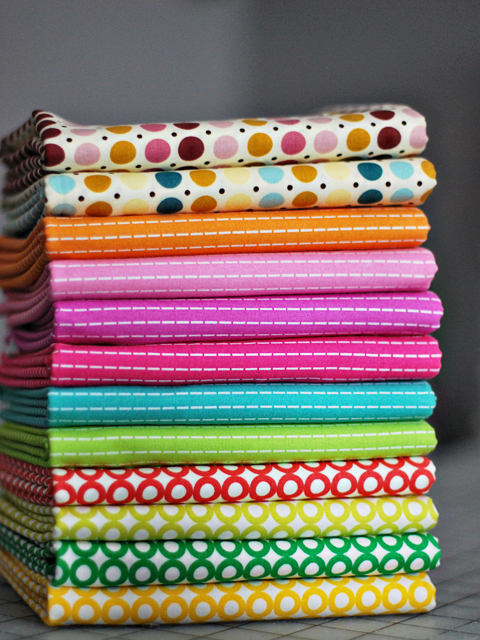 Thanks for sharing this bundle of fabric love! COLOR. Yes I do crave color especially this time of year in the UP. We had another foot of snow on Wed. with more on the way today it seems. 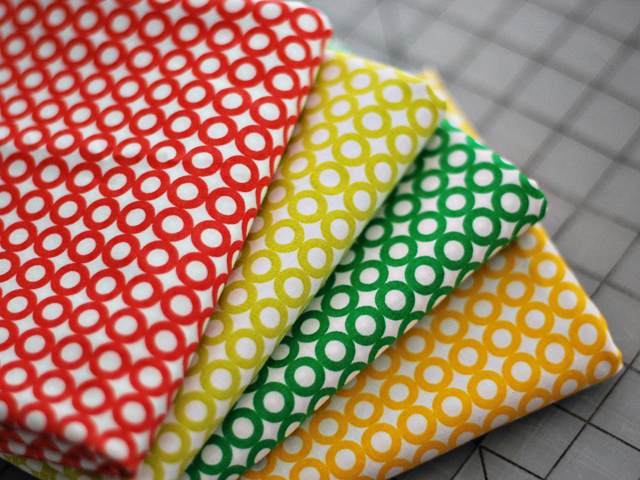 Love your fabric choices, always love circles/dots.